Aster Phoenix with "Diamond Dude", "Dreadmaster", "Captain Tenacious" and "Doom Lord". Duel Terminal - Dragunity of the Hurricane!! "Destiny HERO" (Ｄ－ＨＥＲＯ（デステニーヒーロー）, Desutenī Hīrō) is a "HERO" sub-archetype of DARK Warrior monsters used by Aster Phoenix in the Yu-Gi-Oh! GX anime, as well as by his alternate universe counterpart in the Yu-Gi-Oh! ARC-V anime. Since their debut, they have been believed to be an anti-thesis to the "Elemental HERO" archetype, as specific cards somewhat resemble certain "Elemental HERO" monsters. These cards resemble British anti-heroes and there are several references to British culture within the cards. There is also an emphasis in the passage of time in most "Destiny HERO" card effects, as opposed to the more immediate effects of "Elemental HERO" monsters. In the OCG, the names of all "Destiny HERO" monsters begin with the letter "D" and end with "Guy" with a few exceptions such as "Destiny HERO - Dark Angel", "Destiny HERO - Bloo-D" and "Destiny HERO - Dread Servant". The "Destiny HERO" monsters were designed by Aster Phoenix's father. After he was killed (kidnapped in the dub), Aster inherited the cards, although one was stolen by the D.
It was mentioned by Aster that, just like Neos and the Neo Spacians, the Destiny HERO monsters were infused with cosmic energies. The stolen card was known as the "Ultimate D Card". Aster made it his business to find this card in order to avenge his father. The "Ultimate D Card" was "Destiny HERO - Plasma", while the "Final D Card" was "Destiny End Dragoon". Aster was able to retrieve the former card after defeating the D. "Destiny End Dragoon" was initially stolen by Mike in the fourth season but it was retrieved by Jaden and Emeralda during a Duel that Mike organized and returned to Aster. "Elemental HERO Phoenix Enforcer" and "Elemental HERO Shining Phoenix Enforcer" can be considered pseudo-"Destiny HERO" monsters as they have only been owned and used to date by Aster Phoenix, and their Japanese name also have "Guy" at the end. 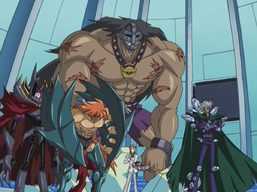 On the GX TV series, the main focus of "Destiny HERO" Decks revolves around stalling for the effect of "Clock Tower Prison", and then manually destroying the Field Spell with another effect to Special Summon "Destiny HERO - Dreadmaster" with a gang of other "Destiny HERO" Monsters to beatdown the opponent. With "Destiny HERO - Dogma" and "Destiny HERO - Plasma" as finishers. These two Level 8 "Destiny HERO" Monsters, "Over Destiny", "Trade-In" and an effect like "Miracle Fusion" can be used to Summon "Destiny End Dragoon". See the "Destiny HERO Fusion Deck" listed below. The effect of "Diamond Dude" is also used as a centerpiece to build a Deck around: it ignores the Cost of cards to activate (e.g. "Discard 1 Card" or "Pay 1000 Life Points"); of the three Monsters is the only one still activately used and is the reason why "Destiny HERO" Decks are always Spell Card heavy. "Destiny HERO - Drilldark" can only Special Summon "Destiny HERO" Monsters from the Hand, as this archetype typically tends to rely on "Elemental HERO Shadow Mist" as a searcher and potentially use "Elemental HERO Blazeman" to either search for "Polymerization" or send "Shadow Mist" to the Graveyard to active his second effect; it is recommended to run "Goblindbergh" (for Rank 4 Monsters) or "Red Resonator" (Level 6 Synchro Monsters) instead of "Drillguy" for the same result. At time of their first release, "Elemental HERO Stratos", "Destiny HERO - Disk Commander", "Destiny Draw", "Destiny HERO - Malicious" and "Reinforcement of the Army" were the fastest Draw / Tribute engine bar none, usually with the single Tribute "Monarch" Monsters and "Jinzo". "Stratos" and "Disk Commander" have no once per turn restriction to their effects: and basically been replaced by "Shadow Mist" and "Destiny HERO - Celestial". ↑ "The Organization | [OCG] Destiny HERO Fusion Deck". YGOrganization. May 13, 2016. Retrieved December 23, 2016. This page was last edited on 29 March 2019, at 04:56.